I LOVE FRENCH FRIES!!! I love 'em! They're crunchy and salty and you just wanna eat em and eat em up! But um...they're fried. So I know they're not good for me. *sigh* It's a very sad truth. But hey...psst....guess what? You can make homemade, baked (NOT FRIED! 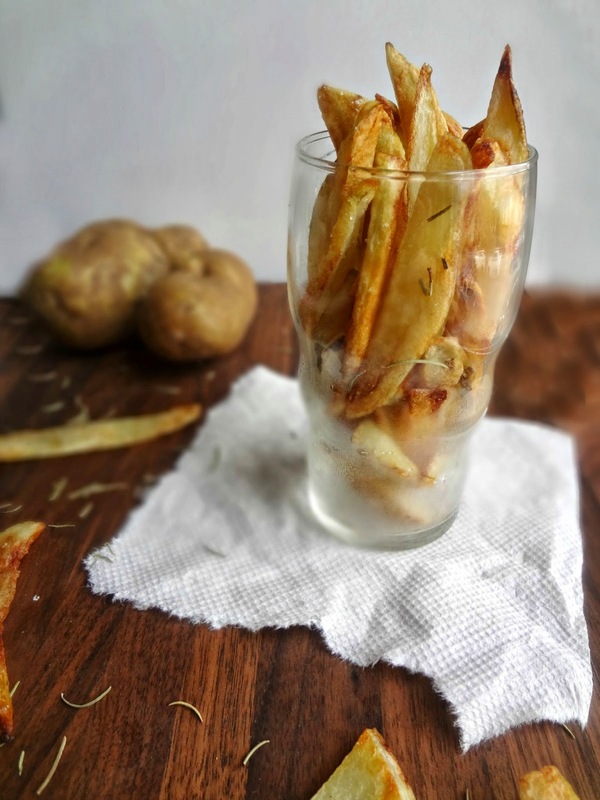 ), fries that are crispy and flavorful and PERFECT! 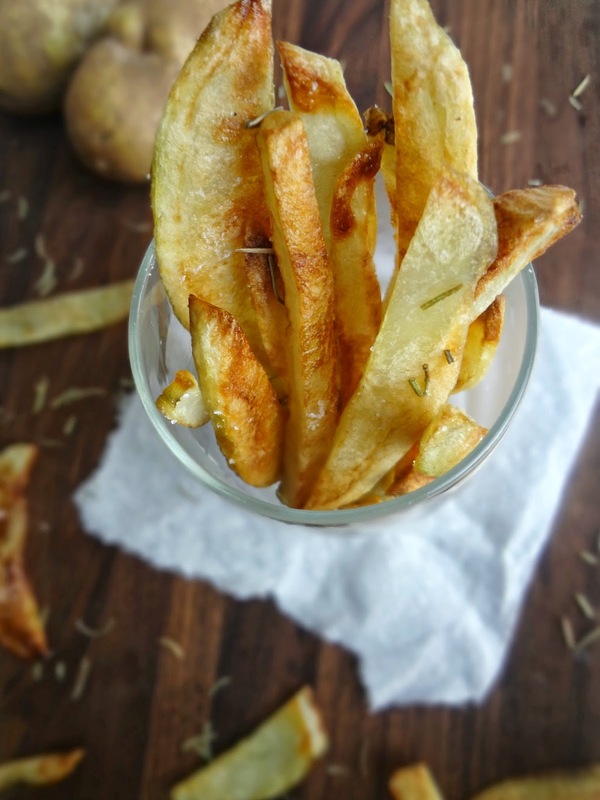 Lately I've also really been loving the combo of rosemary with fries, it's just a really yummy addition (especially if you've got an aioli dipping sauce--or a bearnaise...ooooh that sounds gooood! 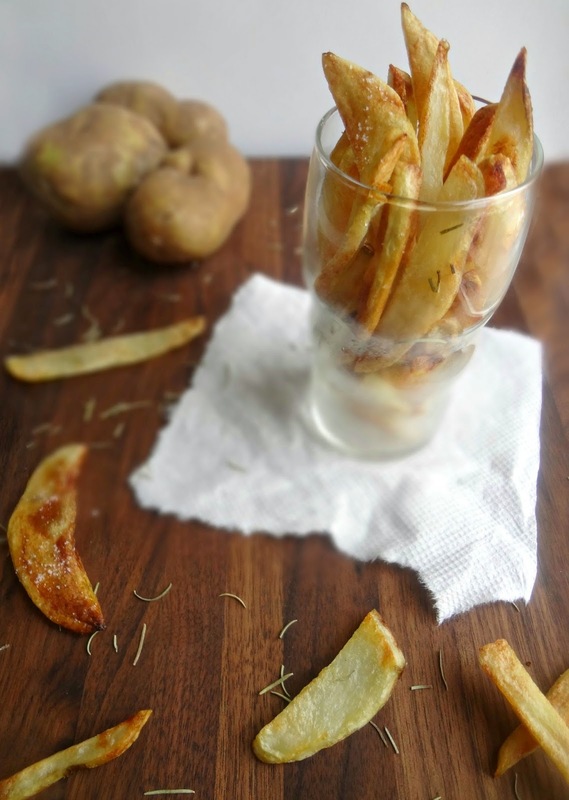 ): I just so happened to have some rosemary olive oil hanging out in my pantry, so I used that for these fries. You totally can use normal oil but OH MAN it was a wonderfully tasty decision to use it! Actually, now that I think about it, this recipe is crazy versatile. 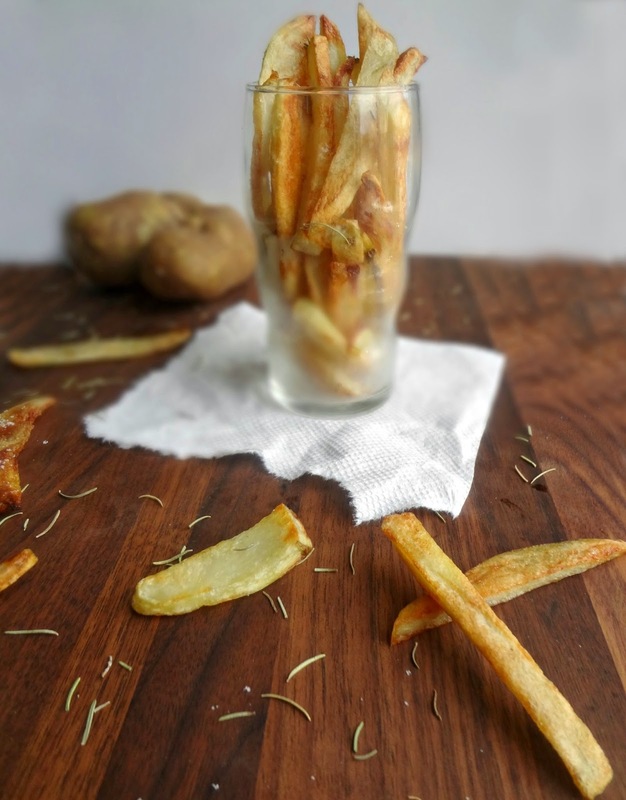 Instead of olive oil you could drizzle these fries with truffle oil. You can season them any way you want! And, of course, you can dip them in a number of sauces (including, of course, ketchup!). You can even put these in a sandwich, I hear that's a thing. The french fry sky is the limit! 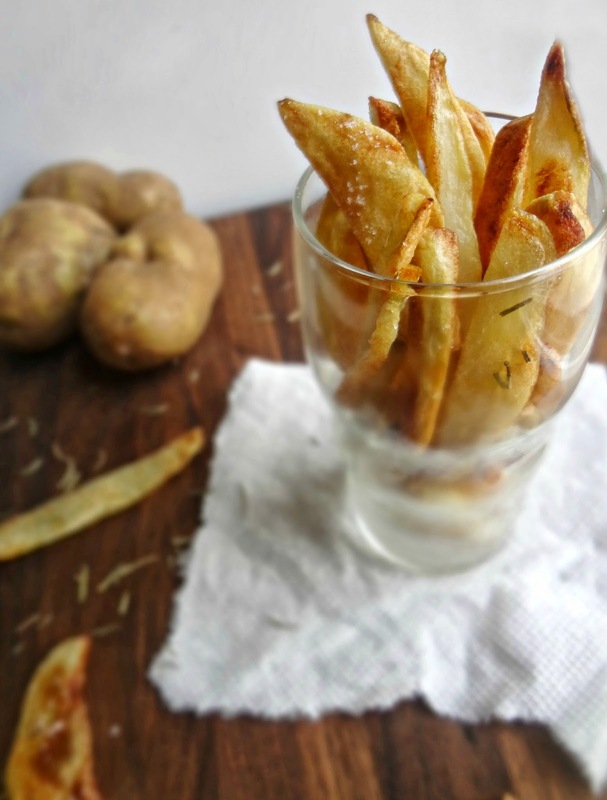 Adapted slightly from Annie's Eats "Baked Oven Fries"
Peel potatoes (it's ok to leave little bits of skin) and cut lengthwise into wedges/fries-about 1/4" thick. Place cut potatoes in a medium-large bowl and cover with hot water. Soak for 30 minutes. Preheat oven to 475F degrees. Pour olive oil onto a heavy, rimmed baking sheet and evenly coat the entire pan (can use a pastry brush to help). Drain potatoes and lay out on paper towels or a clean kitchen towel and pat dry. Place the potatoes on the oiled baking sheet and toss to coat. Arrange in a single layer. Cover tightly with foil and bake for 5 minutes. Remove the foil and bake 10 more minutes. Rotate the pan and bake an addition 5-10 minutes, until the browns are a spotty brown. 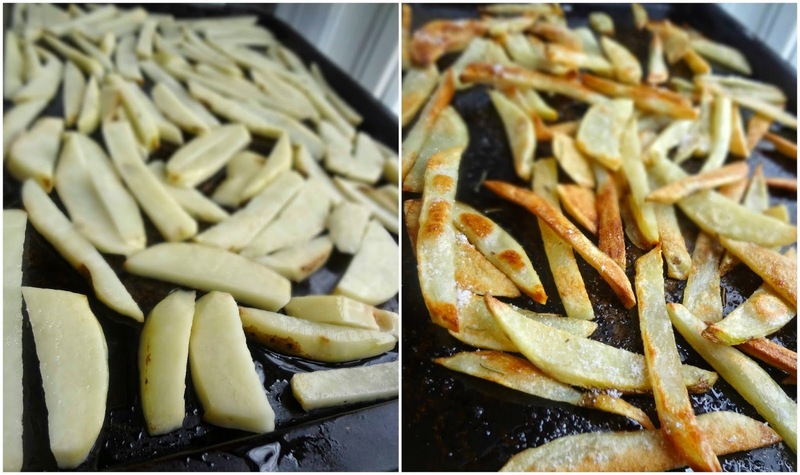 Carefully (using a metal spatula, tongs, or-if in a pinch-a fork) flip the fries. Bake 5-15 more minutes, until golden and crisp. When finished, if the fries seem very oily, transfer to a paper towel to soak up the excess oil (I did not need this). Season with salt and pepper. Serve! Disclaimer-I was provided with a sample of Star Fine Foods' Olive Oil with Fresh Rosemary. I received no monetary compensation and was under no obligation to review. All opinions are my own.